When performing energy audits, we often find that the dampers that manage the proper flow of outside and return air through the building are set incorrectly. When the system is installed, if the outside air (OA) dampers are set to “minimum position” as specified by an engineer, they are set to a certain opening position. For example, the OA damper minimum setpoint is 10%, so the damper is set to 10% open, typically by eyeballing it. But even if it is actually set to 10% open, it might be bringing in 20% - or more - outside air. Why? Because parallel dampers do not act linearly, and almost all economizer dampers are parallel-type. That’s not a problem in mild weather since the OA dampers would be bringing in more than the minimum at those times anyway. But in the extremely cold or hot weather, bringing in more than the required amount of OA increases the load on the heating or cooling system, increasing the cost. 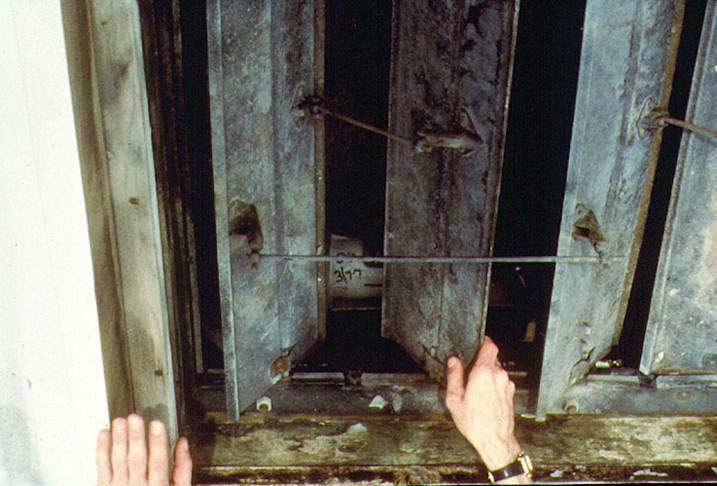 Something else we often find is a wooden 2 x 4 wedged into the OA damper to keep it open. Why? The main reason usually is one of three. The damper operator has failed, or doesn’t operate properly. The linkage isn’t adjusted properly. Something is wrong with the controls. But what does that do to the operation of the system? If the system has a night setback temperature for unoccupied hours, the OA damper is supposed to be closed. When that thermostat calls for heating or cooling, the HVAC system is supposed to handle only the return air, which is already close to the temperature of that thermostat. If the 2 x 4 in the damper causes the system to bring in 20-30% OA because it is held open, costs go up. Many times, even without the OA damper being held forcibly open, it still does not close properly or tightly. Again, this could be a problem with the damper operator, the linkage, or the controls. Facilities must continually check these systems for proper operation. Note: The cost scenario changes based on the region of the country and time of year. VFDs, part of an overall building automation strategy, save energy by reducing the speed of the fan or pump they serve. The energy used by a rotating piece of machinery, such as a fan or a pump, varies directly as the cube of the speed ratio, down to about 30%, depending on the application. For example, if the speed of a fan can be reduced by just 10%, the energy reduction is 0.9 x 0.9 x 0.9, or 27%. If it’s a 20% reduction, the energy reduction is almost 50%! The problem occurs when VFDs, which are designed to run at varying speeds depending on what the systems require, are set to manual, or bypass, and then left there. When we perform energy audits, we often find one or more VFDs set to “bypass.” This means they’re operating at a steady 60 Hz rather than varying the speed according to the needs of the equipment they are supposed to be controlling. There was an electrical problem with the VFD. There was a control problem with the VFD. If it’s set to “manual,” someone needed to set it at a particular speed for a particular reason and simply forgot to reset it when they were finished with that issue. Continual monitoring prevents such issues. Proper cleaning of your building’s heating and cooling system coils goes a long way toward improving energy efficiency, comfort and IAQ. But many people don’t bother, either because they don’t understand the potential benefit - or they don’t know how to do it effectively. Most coil cleaning today involves spraying water and a cleaning solution that will reach only into the first few rows of coils. You wouldn’t spray water onto the first dirty dinner plate in a pile of dishes, let them air dry and call them all clean, would you? That’s essentially what this process does. You still need to look at lighting, water use, plug loads, windows and the building envelope, in addition to the HVAC equipment itself. It simply might require some serious tweaking. As I’ve said often in many of the seminars I do around the world, a properly operated and well-maintained older system may perform better than a new system that is run poorly. And if you do decide to install an entirely new and/or different HVAC system - or individual components of a system - make sure it’s the right size for the building. (See Unexpected Benefits of “Greening” Your Building’s HVAC System.) Of course, be sure it’s the right system for the job – and really does conserve energy. If you're ready to start this process, first have the energy audit.